James Dobbins'(b. 1740, Ireland) story begins in Augusta Co., Va. James and Elizabeth (Stephenson) Dobbins spent their formative years, were married, and began their family. Their sons, Robert Boyd and John, were b. 1783 &'85. The family migrated to Abbeville & Pendleton, SC. James & Elizabeth had seven children. Four daughters and their husbands were: Mary w/John H. Morris (emigrated to Franklin Co., TN), Elizabeth w/George H. Hillhouse (emig. to Giles Co. & Lawrence Co., TN), Sarah w/Hugh F. Callaham (emig. to St. Clair Co., Ala.), Jane w/George Liddell (emig. to Noxubee Co. & Winston Co., MS). Their last-born, James, Jr., b. 1790, died young at home. They & their spouses' families were Scotch-Irish settlers in backcountry of SC. Ten families representing two generations were pioneers and products of history, geography, and culture of frontiers in SC. Six children migrated west, north, & south to new frontiers. 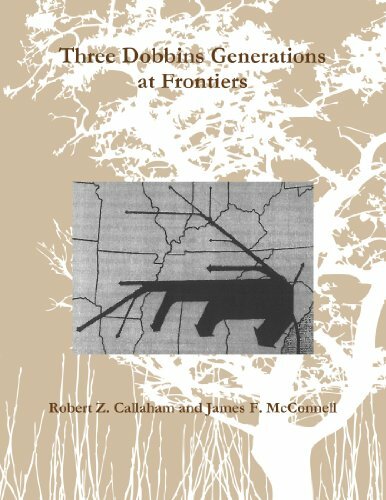 Grandchildren of James & Elizabeth became the third Dobbins generation at farther frontiers.